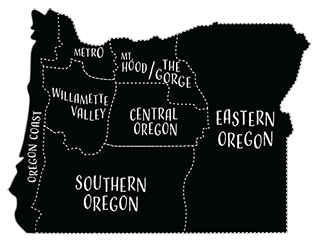 Paradise Lodge lies deep in the heart of Oregon on the Wild and Scenic Lower Rogue River. Leave the hustle of paved road civilization behind and float, jet boat or hike in to an ideal setting for an unforgettable vacation at this luxurious wilderness lodge. The historic lodge is nestled in Oregon’s lush national forest, surrounded by diverse wildlife, just below the famous class-IV rapid, Blossom Bar. Paradise Lodge has 18 cozy rooms located in six different cabins. Each room has a unique charm ranging from riverview rooms to more modern gardenview rooms, complete with a large conference room (no extra fee) for family reunions, wedding parties or corporate retreats. Each room also has its own private full bath and many rooms include 2-4 beds, ideal for family or friend groups. Your accomidations include an overnight stay, a wonderful assortment of appetisers, dinner, dessert, breakfast and lunch if you’re hiking or jetboating to Paradise. The main lodge has a store with treats for the whole family, ice cream, tee shirts, local wines and micro brews. Paradise welcomes your well-behaved dog with a $50 refundable deposit, though they must be leashed on property grounds.